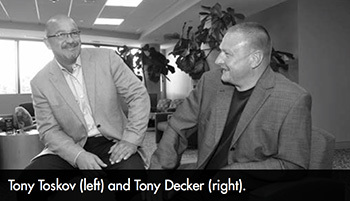 On their own, the two Anne Arundel County friends and businessmen found success: Decker as owner of Bay Area Mechanical Services in Baltimore, which he founded with his wife Denise, and Toskov as founder and owner of several restaurants, including Cancun Cantina in Hanover, Reckless Ricks in Glen Burnie and Two Rivers Steakhouse and Bamboo Bernie’s, both in Pasadena. But together, they formed a valuable partnership in 2007 that would benefit Baltimore Washington Medical Center patients for years to come. 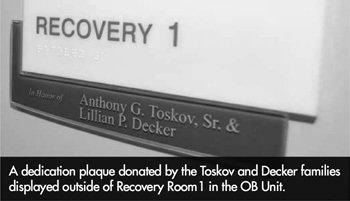 Decker and Toskov committed to a five-year gift as part of the Baltimore Washington Medical Center Foundation’s capital campaign – a fundraising initiative to support the hospital’s new patient tower and labor and delivery unit. Their gift also supported the Foundation’s annual golf tournament fundraiser. “We chose to support the hospital because we believe in it,” Decker says. “And it’s part of our community,” Toskov adds. “You have the opportunity when you’re successful to give back to the community and that is important.” Both Decker and Toskov grew up in Anne Arundel County. Decker spent his childhood in Glen Burnie and Toskov in nearby Ferndale. They witnessed first-hand BWMC’s transformation from a small community hospital to a regional medical center. Remembering the early days of the hospital, Decker recalled his many boyhood visits to the hospital’s emergency room in the 1970s. “It’s become a facility that can provide so many different variations of care to the community. The physicians and the range of services are invaluable.” It’s also become a facility Decker, Toskov and their respective families are proud to be a part of. “The community needs BWMC and BWMC needs the community,” Decker says. As their initial commitment comes to an end in 2012, both men have already pledged identical support to the hospital through 2017. “It’s an honor to be part of the hospital,” Toskov says. “Giving comes very natural to them,” says Adrianne Carroll, major gift officer at the BWMC Foundation. “They understand the importance of being philanthropic.” Many Anne Arundel County business owners understand the value of philanthropy. In fact, local businesses are a large part of the hospital and Foundation’s success, says Beth Peters, vice president for development at BWMC.